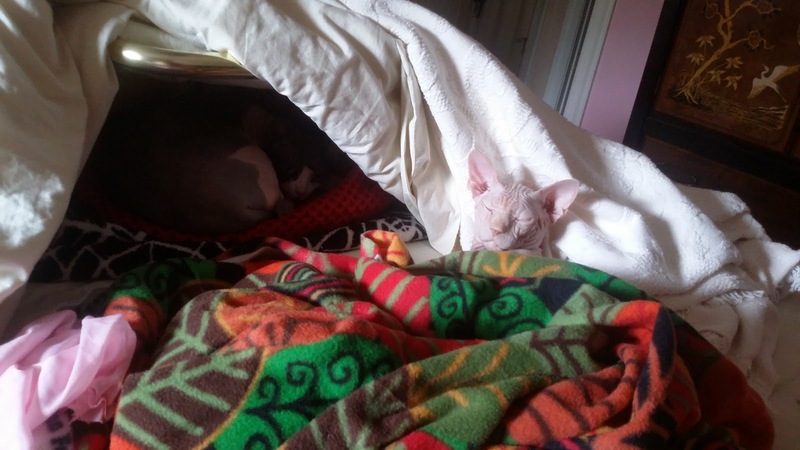 Moshe Moshi and Lexi Liu say they are ready for Sukkot, but I don't think they've quite had it right. The word Sukkot derives from sukkah, or “booths” in Hebrew, and is a celebration that commemorates the temporary shelters that Hebrews lived in for 40 years while they crossed the Sinai desert after leaving Egypt. In Torah, Leviticus 23:42-43, Jews are instructed to “live in sukkah for seven days, so your descendants will remember that I [the Lord] had the Israelites live in wilderness shelters when I brought them out of Egypt.” The holiday represents human fragility and urges Jews to appreciate their homes and bodies. The booths are small wooden three-sided structure, which has branches as a roof, is usually built in yards, or on porches, courtyards, lawns, balconies, and rooftops, and must be big enough to dwell. The branches, known as sechach, need to be thin enough so that occupants can see the stars above, a reminder of the power of God as the creator. Most families opt to build their sukkahs from scratch, but some are prefabricated and easy to assemble. Typically decorated with harvest vegetables such as corn and dried squash. Look a lot like Thanksgiving, which is not a bad metaphor. The festival last seven days and all meals eaten inside the dwelling. 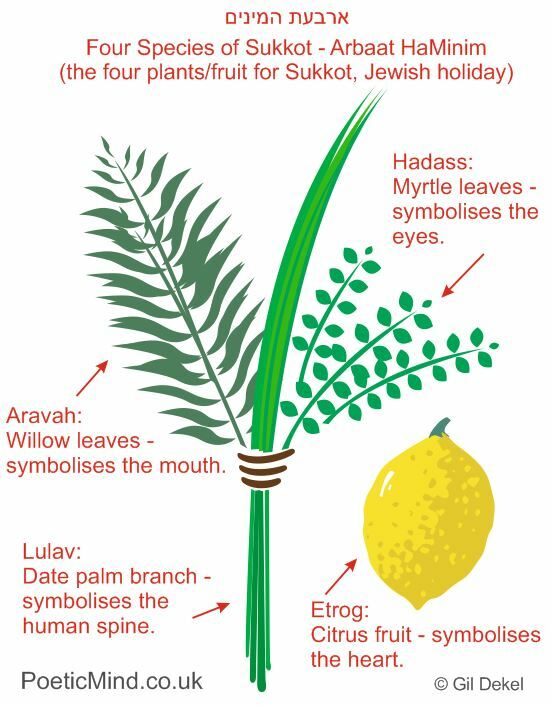 During the festival, Jews are instructed to hold four plants: hadas (leaves from the myrtle tree), aravah (leaves from the willow tree), etrog (fruit of the citron tree) and lulav (palm frond). The practice is outlined in Leviticus 23:40: "On the first day you shall take the product of goodly trees, branches of palm trees, boughs of leafy trees, and willows of the brook, and you shall rejoice before the Lord your God for seven days." Customary foods are from the autumn harvest. In the U.S., most Sukkot recipes include pears, apples, carrots, sweet potatoes and other root vegetables. Wanna wish me a Happy Sukkot? That's cool. I wish I received more questions from non-Jewish friends about the appropriate greeting. On Bitstrips that I use often on Facebook, they had a "Happy Yom Kippur", which is not bad by any means, but not the best greeting (Good Yontif or Fast is better). 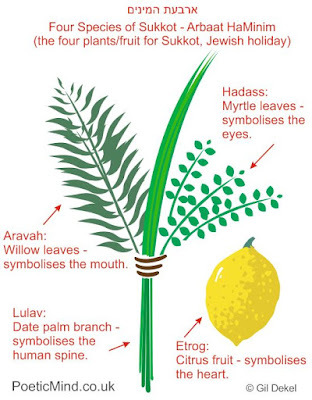 For Sukkot a customary "Chag Sameach" (pronounced KHAHG sah-MEHY-ahkh) is fine. The saying literally means joyous festival.